Well, I could obviously go on and on! But ‘You get the picture!’ If you don’t have the second volume you are missing a lot! Both are available right now on Amazon worldwide. An author’s greatest pleasure is sincere praise from other authors. They, more than anyone else, realize what it takes to put together a work, be it a novel, a work of detailed research, or any other genre, consisting of hundreds of pages which captures to attention of the reader and makes it difficult to lay down once started. 5.0 out of 5 stars A Masterpiece! 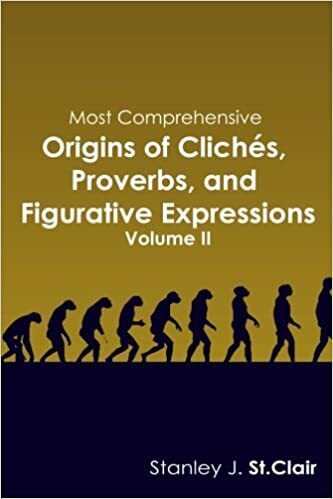 Stanley J. St. Clair’s “Most Comprehensive Origins of Clichés, Proverbs, and Figurative Expressions” Vol. II is a masterpiece! Be prepared to delay your own work when you get hold of this book. It will take away your focus from whatever you’re doing at the moment and send you on a delightful journey through a world of discovery. It’s a total delight to sit and read where our most used expressions actually came from, where they were first used. This book will be around for years to come and will be used over and over by those wanting to know where those little sayings came from. It will be a very special tool for many, many people and will never be far from hand when they want to look something up. I could go on and on, but if you’ll excuse me, I’d like to get back to the book and look up a few more expressions. This book is a must for your library! 5.0 out of 5 stars This book is “in apple pie order” ! Stan St. Clair has done it again! He has provided an intriguing, interesting and extremely well done compilation of expressions used in language. Whether one is a reader, a writer or simply one who enjoys using oral language effectively in conversations, this book is a treasure to have in hand at all times. This is Volume ll and makes an excellent companion/continuation of what St. Clair did in Volume l. For the person who appreciates the richness of expressions in language, this book satisfies like no other that I have found. Beyond all of this, it is a highly enjoyable book to simply pick up for a relaxed moment and discover the meaning of phrases, their origins and the history that supports many. Both volumes are impressive with their large number of entries, all well documented. I hope there will be a Vol. lll. I’ll be first in line to get a copy. This book, and the original volume make excellent Christmas gifts and they are available on Amazon worldwide.